Victoria de Durango, known simply as Durango to most people, is one state south of the U.S. - Mexico border, approximately 680 (1,090) miles south of El Paso, Texas. After crossing the border, it's about an 8 or 9 hour drive. 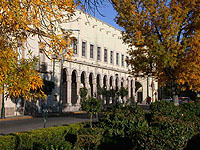 The city is located on the eastern flank of the Sierra Madre Occidental mountain range. The mountainous, rustic atmosphere made Durango the ideal setting for the old western movies that gave the city its fame as "La Tierra del Cine" (the Land of the Cinema). Artists who walked the streets of Durango include John Wayne, Charlton Heston, James Coburn, Nick Nolte, John Candy, Richard Harris, Dean Martin, Anthony Quinn, Charles Bronson, Glen Ford, Shelley Winters, Ernest Borgnine, Robert Mitchum, and Rock Hudson. Durango is still an important site for international filmmakers. One of its older movie sets, el Villas del Oeste, has been well maintained and is currently occupied as a small museum and amusement center. It features local restaurants, vendors, and a dance hall. Contemporary Durango is probably most visited for its colonial downtown area and it's majestic mountains and fantastic Chihuahuan Desert. History buffs, nature lovers, and adventure sports fans looking for fantastic landscapes fell at home in Durango. 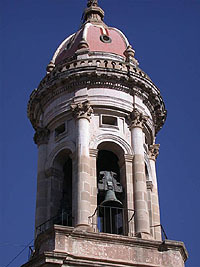 As with most Mexican interior cities, all routes, in Durango, lead downtown, where most of the city's historic buildings, monuments, and plazas stand among shoppers, tourists, and business people. Structured on the main Avenue, 20 de Noviembre and lined to the south by Las Alamedas, Durango's historic downtown area is fairly web defined and easy to navigate on foot. Accommodations vary from inexpensive, old-fashioned hotels through more modern, franchised facilities. Most Durangan downtown hotels are reasonable priced, and only a few of them charge more than $60 or $70 (U.S equivalent) per night. Durangan kitchens sizzle with hot, spicy chili and old-west style plates, and you can find dining options that vary from mobile vendors with "chinchulines," (fried tripe tacos) and "barbacoa" (steamed beef head meat - not at all like the U.S. concept of "bar-b-que"), through full-fledged formal dining, with delicious Durangan plates, like caldillo, beef fillets with delicious salsas and guacamole, shish-ka-bob, enchiladas, frijoles charros, and many other fine dishes. Durango, with its rustic landscapes, is popular among adventure travelers. Until recently, poorly maintained highways and lack of international flights made it rather inaccessible compared to most of the northern states in Mexico. As such, it's full of treasures that much of the foreign public has only recently discovered. It's old western style and abundant historic buildings, monuments, and plazas also makes it attractive to history buffs and travelers who like the flare of the wild west. Although the city's not prominent on the maps of the Spring Break crowd, it offers attractions for younger visitors that include endless possibilities for adventure sports and a bustling nightlife in some of the city's discotheques. One of the more popular night sites even has an indoor rodeo, dance floor, bar, and restaurant situated inside an abandoned ex-Hacienda, which both the older and younger crowds will enjoy. The city's night hot spots feature both live and recorded music, and live groups are generally oriented toward "Norte�os," "Banda," and other traditional Mexican style music. Recorded music dance bars and discotheques lean toward pop, disco, and rock music. Shoppers will enjoy Durango's downtown semi-open air market (it's now covered by a laminate roof that really makes monsoon season shopping a lot more comfortable). Here, visitors will find traditional Durangan style "recuerdos," emphasizing wood and leather items and many ceramics and textile items from all over the country. The downtown area, in general, is a fascinating place to shop because many merchants have maintained the colonial style of their shops, and you'll find most of your shopping needs there. Just outside the city, lie the forested foothills of the Sierra Madre Occidental, a massive mountain range that extends from Jalisco to the northern limits of Mexico. Just to the east begins the Chihuahuan Desert, North America's largest and most biologically diverse desert. Activities in both the mountain forests and desert include hiking, mountain biking, tour biking, swimming, camping, climbing, repelling, fishing, hunting, and general sight seeing. Being an important historical city, Durango is full of museums, including the ex-Hacienda in La Ferrer�a, the Intsituto Mexicano de Arte y Cultura in the Colonia Obrera, and several smaller museums in the downtown area. 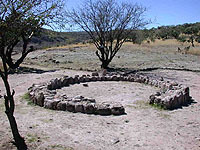 Being distant from the U.S. border, Durango is not subject to massive influxes of U.S. tourists on the weekends or U.S. holidays, and spring break travelers tend to spread themselves over the more remote areas of the state, looking for lone desert roads in the Zona de Silencio or logging trails high in the mountains. Among the most important dates for visitors to Durango are those of the Festividades de la Ciudad (City Festival), held in early July. The event kicks off with a typical Durangan parade, which marks the opening of the fair, where one may see arts and crafts from all over the country, taste brick-oven baked pan de soya (soy flour bread) or sit down for a full-fledged meal. The fair also features national concerts and shows, mechanical rides, and local and national vendors. Another major Durangan event, featured during the City Festival, is a reenactment of the arrival of Francisco "Pancho" Villa and the Divisi�n del Norte at the city's train station. for providing the information for this City Guide. The steeple at St. Augustin church in Durango. 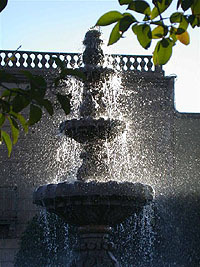 Fountain in Durango's central plaza. Durango's Justice Building among fall colors. 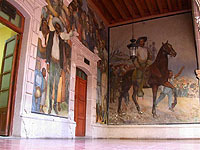 Durango's Governer's building is decorated with murals of the state's historic and revolutionary past. 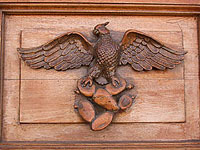 Details from a colonial home in the Colonia Obrera. 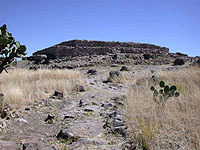 The pyramid at the Ferrer�a Ruins, Durango.